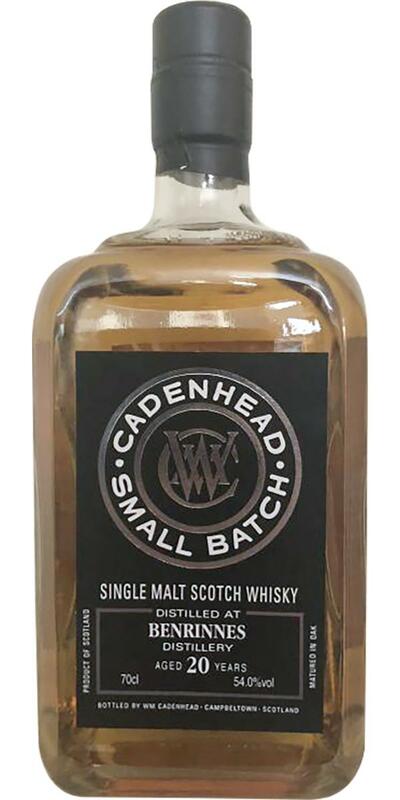 In bright light (preferably in sunlight) you can clearly see that Cadenhead has dispensed with the cold filtration. Many small barrel sediments are visible after pivoting the glass. The strong alcohol (54%) is well integrated. The first nose is already promising and complex: Overripe (partly tropical) fruits and a great sweetness set first accents. Fresh tangerines, green apples, hints of oranges, kiwis, peaches, exotic fruits, vanilla ice cream, muesli, blossom honey, a slight nuttiness and mild oak notes complete the multi-faceted and harmonious nose. 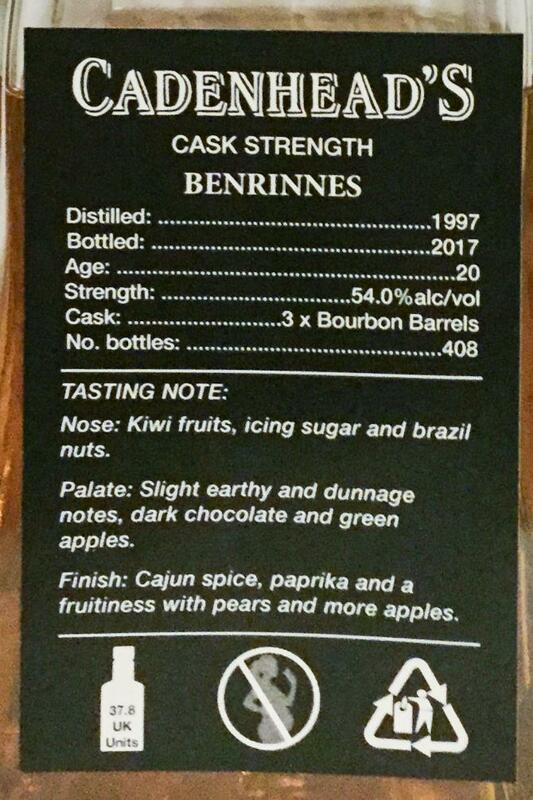 After the repeated tasting I like the Benrinnes with the addition of a few drops of water and an estimated alcohol level of just over 50% best. The sweet fruit notes develop even better and noticeably promote harmony. Full, mature and smooth start. The mouthfeel is silky soft, almost buttery (with the addition of a few drops of water). The malt sticks literally throughout the mouth and stimulates the salivation properly. On the first sip, I feel a slight tingle at the tip of my tongue, until the fruity-sweet cocktail bar has opened. Freshly cut apples, mandarins, tropical fruits, honey and vanilla ice cream are again present. Spices, hints of herbs, nuts, light earthy aromas, mild pepper and oakwood aromas quickly contrast with the sweet fruits. 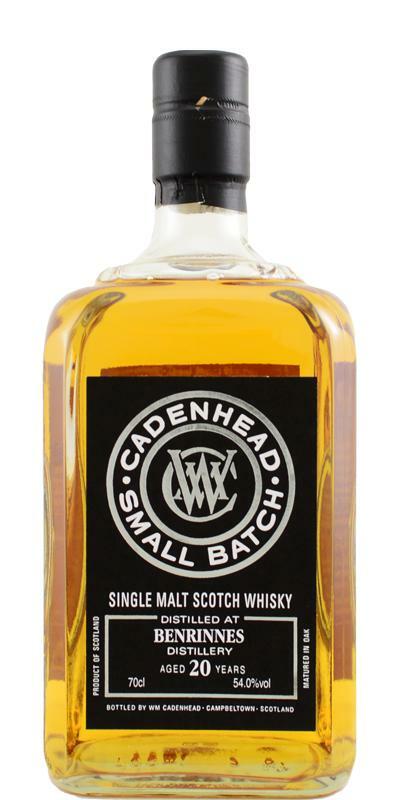 Medium to long, fruity, sweet and spicy with a subtle pepperiness on the palate. The fruit notes and sweet flavors gradually fade. Spicy oak notes, nuts and a hint of dark chocolate follow. 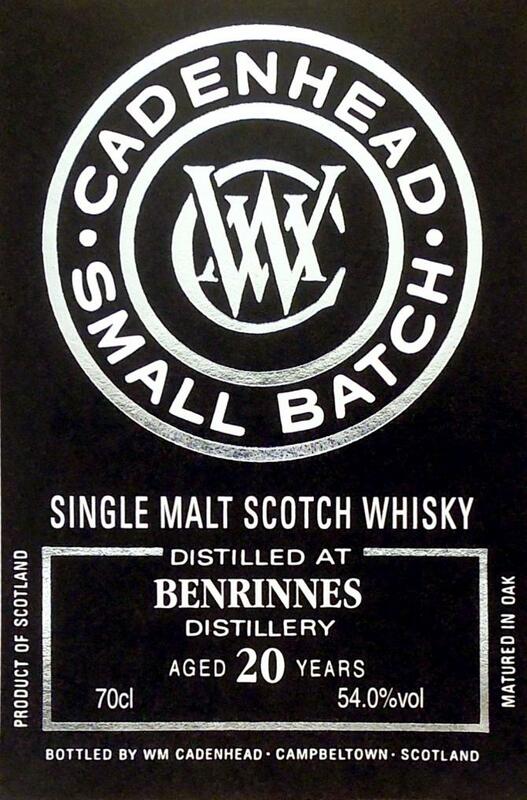 The Benrinnes leaves a minimal dryness on the palate. Overripe fruits, mint. Bourbon classic profile. Caressing and woody, it closes a little in a second time to something more austere where I detect the apple. We find the fruits too oxidized with butterscotch. Very nice consistency with the nose. Very nice spices come to complete all, with some tannins. Coffee notes. Very nice aromatic development on the fruits which seem oddly not to have a sufficient maturity now. The initial nose was promising, reminding me of greats such as Glenturret 1988 (Cask 529). This Benrinnes is sharper and more austere though. Less overtly tropical with more tannins and artificial-sweetener bitterness, which I’m never too fond of. 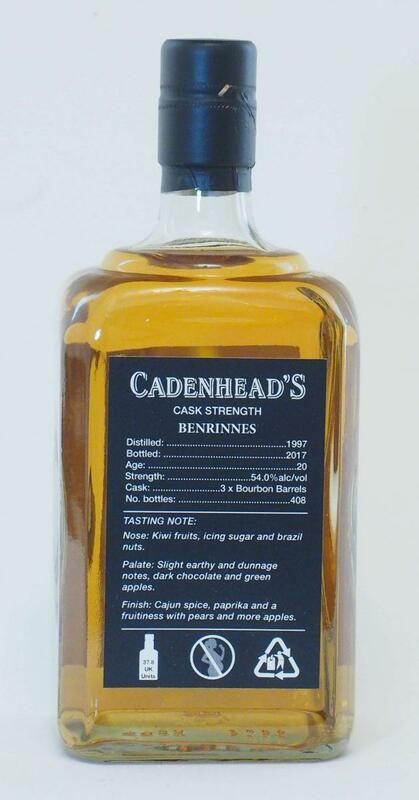 Ex-Bourbon Benrinnes do not seem to have the “fatness” to them, that their sherried counterparts can induce. Quality stuff nonetheless. Sweet and tropical – in an artificially fruity wine-gummy way, with mangos and green apple syrup. Rather juicy, with vanilla and caramel lurking in a corner somewhere. If you let it breath a bit, the Bourbon wood imparts acidity. With water: However, adding water combats this (im my eyes) distracting feature somewhat. Crushed grapes, light vegetal notes, and faint banana is what is left at this point. Medium-sweet arrival. Quite behaved for this ABV. Accompanied by citrus fruit – oranges and sugared limes – and menthol. A sign of its age I recon. With water: plum and cherry eau de vies, a shadow of caramel, and over-brewed mint tea. Medium. Volatile associations of caramel and toffee, which displaced by an onset of dryness. More green tea and tannins as this Benrinnes fades away. N: a bit fizzy with stone fruits in syrup. Kiwi, sure. Apricots, perhaps. A very slight pleasant waxiness. T: fuzzy peach candies, sweet and sour, slight dustiness. Milk chocolate. Mouthcoating. F: quite spicy with white pepper and oak. Pop rocks and sour keys. Only a slight waxiness persists throughout, but is very welcome. Only the slightest notes of age to this one and quite zippy, I find. If 5cent candies are your thing, that’s what this malt reminds me of. Sweet and sour (especially peach) candies. Waxiness is one of my favorite notes, albeit slight. So that gets an extra point from me.